Ask any Permaculturist and I’m sure they will tell you that the first few months, even years on a project are the most intense and busy, as there is always a long list of things to do. In the developing stages of any permaculture site one is faced with the overwhelming task of understanding your site in an attempt to bring it back to life. Understanding the play of the elements through or over the site takes time, months of focused observation and thoughtful interaction. Every project will have its end goals and numerous steps along the path of development to achieve these goals understanding the progression of these steps itself takes time. With the lens of Permaculture design organizing months of observation into a detailed plan for your space and time takes shape and the benefits are then quick to follow. Barefoot Soulutions recently held one of their Practical Permaculture Workshops (PPW) in the Highland areas of Tigoni/ Limuru about a half hour from Kenya’s capital Nairobi. This area is known for its cold weather and rolling hillside of tea. With rich, yet dense red clay soils, it would be hard to find a local resident without a portion of their plot dedicated to some kind of food production. The roadsides are often dotted with small tilled patches of soil growing the usual maize, bean or sukuma crops. And any field not under continual tillage will usually host napier grass and a lot of weeds. Old yet fruitful Avocado trees boast some of the plumpest fruits around, and banana, loquat trees and passion vines seem to have their place in every plot. The one week PPW was hosted at the Brackenhurst Conference Center a key and historic part of the Tigoni Community. The conference center rests on top of a hill previously landmarked by a lone, enormous Muna Tree. Today, although the iconic tree still stands, Brackenhurst’s reputation is marked by their dedication to the environment with a forest regeneration program of over fifty acres of restored indigenous highland forest. The center boasts an incredible biodiversity of flora and subsequently fauna, through an initiative driven by Plants for Life International, a partnering organization with the aim of developing the Brackenhurst grounds into an internationally recognized botanical garden. Barefoot Solutions role through the PPW was now to expand the facilities environmentally conscious practice with a focus on food production and ecosystem enhancement through the application of Permaculture. The PPW’s focus was to demonstrate both on a small and large scale what was possible through the application of permaculture techniques. Given permission to adjust the old Shamba (Vegetable garden) spaces and also to cut new gardens, the small team of eager workshop participants guided by the veteran Tichafa Makovere, got to work applying the concepts they had learned in the classroom to the Brackenhurst grounds. In the middle of Brackenhurst’s existing farm fields, space for two large Mandala Gardens were allocated; through gentle movement of the soil into workable sized beds with dedicated and mulched pathways. Keeping slope in mind keyhole beds were added and planted with thick sweet potato ground cover to capture and store water. Moving away from the traditional large tilled patches of ground planted as monocultures, Tichafa had participants racing back and forth from the field to the nursery beds to “bring more seedlings” to “fill those gaps” asking “do you remember the companions to cabbage?” “What about beetroots” all to leave behind a well-designed and diversified showcase for the farm management to replicate. On another day of the course, a Perma Blitz took place on the Woodland Star International School’s Playground space. Woodland Star International is within the Brcakenhurst grounds and is fully on board with the overall vision of making the campus a showcase site for what good environmental practice can look like. They loved the idea of developing a space for their students to learn and participate in food production and asked that during the PPW, Barefoot and the workshop’s participants impliment a ‘sensory garden’ on a relatively unused corner of their playground. So that’s what we did; working against the clock we removed a thick layer of Kikuyu grass lawn and fought with the hard-compacted soil to bring to life a sensory maze that would entice the students into the space. Mulching our pathways with fresh straw the un planted mandala growing out from an indigenous tree as the center piece was already a treat for the eyes. Then adding bananas and squash for quick growth and a tasty end product incorporated both the ground cover and vertical growth that permaculture systems promote. Finally, students were then involved and helped in the planting of a diverse seed mix to bring edibles, color and smells to the new beds, including peas, citronella, mint, sunflower and marigold to mention a few. The course’s practical element didn’t just have participants working on the Brackenhurst Campus though. Two days of field trips to three nearby sites were visited over the workshop’s duration to give the team the best local examples of Permaculture techniques in practice. A Journey down the Rift Valley’s escarpment to the Care of Creation Kenya demonstration farm site taught the team about soil conservation and soil building techniques. Simple demonstrations were shown to showcase how effective the simple addition of mulch on garden bed can save moisture and prevent soil erosion, increase fertility and soil life, resulting in healthier crops and higher yields. A visit to the Mlango Farm, was awe inspiring to the course participants as they saw what a dedicated team lead by good instruction and design could do to turn steep hillside into a flourishing and profitable business. Beautifully leveled terraces supported by banks of fruit trees and perennials like rhubarb and sweet potatoes, bordered large patches of herbs, greens and root crops. Mlango Farm put smiles on everyone’s faces and filled their heads with questions despite the steep hike in high elevation. And finally, the group visited the Idili Permaculture Demonstration Farm. This is a site I have been SLOWLY developing for the last two years, when time and budget permits. If nothing else the site showcases what can be done by a couple people on a shoe string budget, through trial and error and lots of observation. Participants learned about zonation and how the placement of certain elements can help in time and resource management. Planning in time and space could be seen in the agroforestry demonstration plot where participants tried their hand at measuring contours with an A-frame to create a new swale system. They left the site with a new kitchen garden space, again in a Mandala design planted mulched and awaiting the rains. A few months on and the gardens implemented on the course are growing strong, they boast a diversity of crops and have truly been a showcase to the staff and guests of Brackenhurst. But as I mentioned in the opening of this blog, these concepts when first introduced require hard work and follow-through and require a time to prove themselves. In my various follow up visits, I received many comments about how well the gardens were doing and inquiries about unknown plants that were now thriving in these spaces. 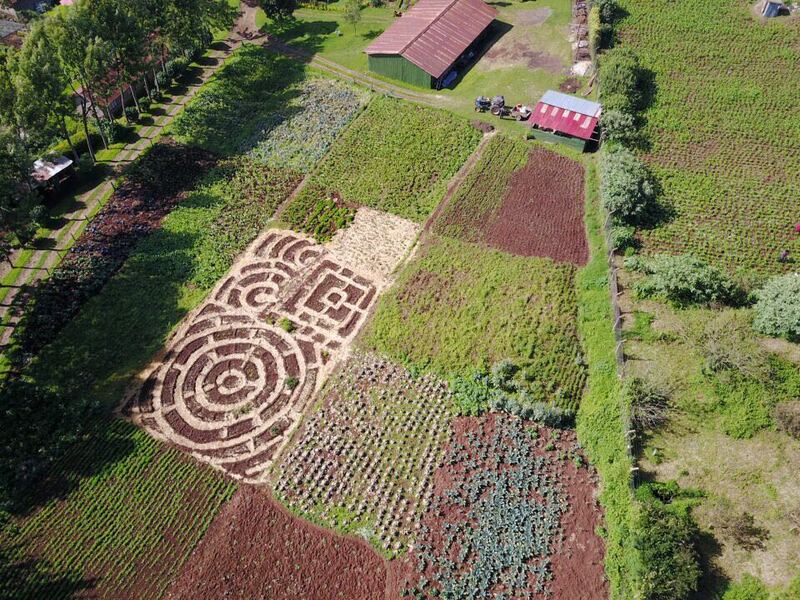 Although the mandala designs and companion planting haven’t become the norm on the Brackenhurst Shamba, YET the ‘seed’ (excuse the pun) has been sown and there is an excitement about what may happen next. If you enjoyed reading this blog post about our last Permaculture course and are interested in doing one with us, you are in luck! Our next Permaculture Design Course will be held in November 2018 at Distant Relatives Eco Lodge in Kilifi. Exact dates are still to be confirmed but if you are interested in knowing more please contact the below email addresses. Watch this Space… Abundance is on its way.